At the heart of our sales and marketing automation solutions is Microsoft Dynamics CRM, a flexible and cost-effective customer relationship management system that quickly adapts to your changing needs. Affordable, powerful and easy to use, Dynamics CRM helps you generate new opportunities and mine business intelligence with robust reporting and analysis tools. Collaboration is easy when everyone is on the same page. Dynamics CRM stores all your customer and prospect information in a single database to inform activities and decision-making across your organization. With its flexible drill-down options and clear, comprehensible reports, your sales, service, marketing and executive teams can work in unison to better serve your customers. Dynamics CRM incorporates Microsoft’s familiar user interface to accelerate adoption and simplify processes with graphs and filters for accessing the most pertinent, role-based information. The entire database is mobile-ready and can integrate with user productivity tools and social conferencing and communication systems that your customers and business partners already use. ​InfoGrow and Microsoft make it easy to implement Dynamics CRM within your current IT infrastructure. Each hosting option has unique benefits and considerations, so we’ll work with your staff to identify the approach that’s best for your organization. For your convenience, the database can be moved from one hosting platform to another to accommodate changing IT requirements. On-Premise: The logical choice for organizations with dedicated IT, application and process support resources. When choosing this option, consider that continuous tuning and maintenance are needed after deploying Dynamics CRM to maintain its value. Because CRM integrates your sales, marketing and customer service processes, be prepared to measure results, align and realign processes, and adjust CRM on an ongoing basis. InfoGrow-Hosted: The best option for minimizing IT expenses without compromising the quality of your CRM solution. Also ideal for clients that require application integration and reporting at a level not available through Microsoft Dynamics CRM Online. Our data center offers hosting, disaster recovery and managed services to optimize availability and ensure safe, secure access to your data. We also provide end user support so you can stay focused on your business. Microsoft Dynamics 365: Ideal for organizations and workgroups seeking to establish a culture that shares customer and prospect data with minimal IT support. Hosted by Microsoft, Dynamics 365 offers the same functionality as other hosting options with an even greater focus on integration with other Microsoft apps in the cloud. These solutions are scalable and quickly adapt to your needs so you can realize an immediate business impact. And as your needs grow, you can add new applications to your system to benefit from expanded, fully unified business productivity tools. 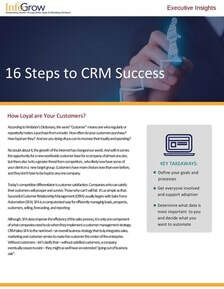 ​CRM holds a treasure trove of information about your leads, prospects and customers. From CRM add-ons to Application Development, InfoGrow has flexible options for gleaning the most value from your data. Mapping Solutions: Nothing highlights trends and physical locations better than maps and graphical representations. Using Microsoft Bing Maps, InfoGrow offers preconfigured CRM Mapping Tools to visualize market potential and improve sales and productivity. And through our Mapping Application Development Services, we can create personalized proximity and customer mapping tools that will boost your competitive advantage. Email Marketing: InfoGrow’s CRM2Emails add-on is ideal for organizations that don’t need a full-featured marketing automation solution, but want comprehensive email marketing capabilities. Fully integrated with Constant Contact®, a recognized leader in email marketing, CRM2Emails extracts targeted lists from Dynamics CRM to power your marketing and customer outreach campaigns. The status of each message is captured in Constant Contact and automatically linked to CRM records, as are various metrics for tracking recipient behavior and the overall effectiveness of your campaign. Contact us to learn more about Microsoft Dynamics CRM and how it can successfully drive your sales, marketing and customer service activities.